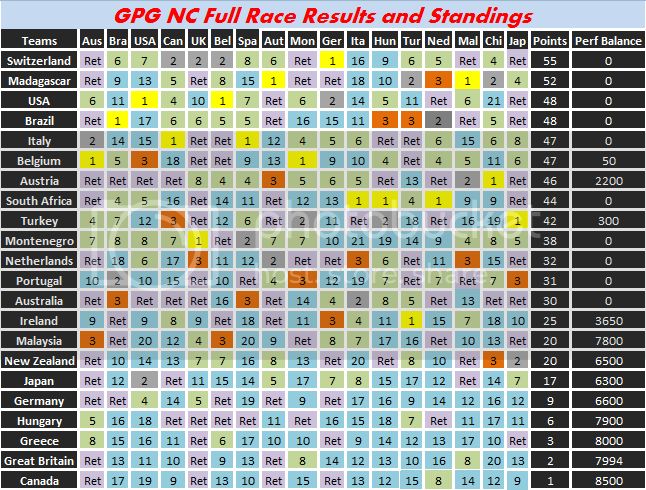 The GPG Nations Cup is an AI based league where a player represents a nation, and races are ran on Grand Prix 4 by a race director, with the results posted here. Rules are on Post 2. It is your responsibility to read these, and it will be assumed every participant/potential participant has so. Edited 50 time(s). Last edit at 04/08/2019 04:55PM by GPG_Nations_Cup. Joining is easy, simply state the fact that you wish to join in the thread, and you will be added to the reserve list. You will gain a seat only after your car and helmet have been painted, your number has been chosen, and your driver has been annouced. After that you will be allocated a slot as and when they become available, in the order of the reserve list. -The championship will consist of 22 teams. Each team must be themed on a valid nation of the world as per the owner’s choice. Multiple cars of the same nation are not allowed. -Interested new entrants will be placed on the waiting list if there are no vacancies. -If there's a vacancy and noone to fill the seat, numcars.ini will be used to reduce the grid-size until a new team enters. -The carshapes are now decided by the most popular suggestion of all those involved. Depending on the community the shape will change from season to season. -A maximum of 2 carshapes may be allowed, and must be of similar proportions. -The livery of each car should be relevant to the nation the car represents. -All cars should have the nations country labelled on the rear wing. -Nothing regarded as offensive should be painted on the cars. -Sponsorship is allowed and should be from the Nation provided, except for engine supplier (when none available in the chosen country), tyres and fuel/rims (eventually). -Available tyre suppliers are: Firestone, Michelin, Continental, Yokohama, Hankook. 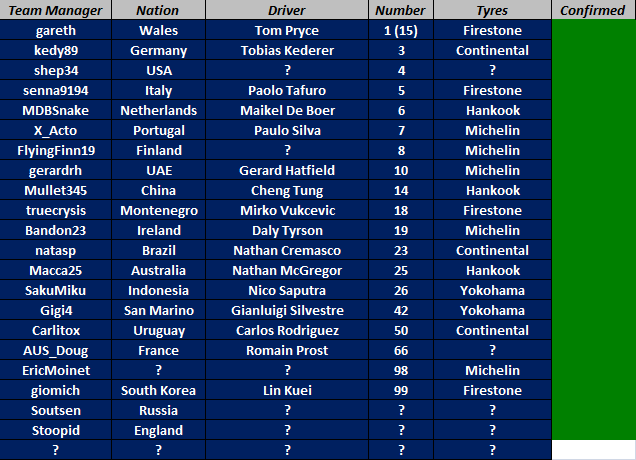 -Driver numbers are made by choice with number 1 being reserved for the champion. A participant keeps his number until he retires from the series, or changes it during his time active in the series. -Helmet liveries may contain any design and sponsorship asides from tobacco. -Tobacco sponsorship is NOT allowed, as some countries do not allow images to be uploaded that contain tobacco advertising. -Textures have to be sent in .psd format. -Teams on the waiting list have to prepare textures in case of promotion. If no textures are sent/available when promoted, entry will be denied and the team is moved to the end of the waiting list. The slot will be given to the next one in line. -Qualifying shall be 30 minutes in length, 22 cars on the track, 4 laps of fuel per stint with a maximum of 16 laps. Qualy coverage is optional, results screen is enough. -Race distance shall be set to 66% of full race distance (~45min), with 1 mandatory pit stop per race. -If a driver does not complete the pitstop, penaltys may be used to correct any erroneus result. The penalty will be based on track positions, length of pitstop to make sure the driver receives a penalty reflecting his overall gain in the race as every track is different and therefore the penalties need to reflect this. 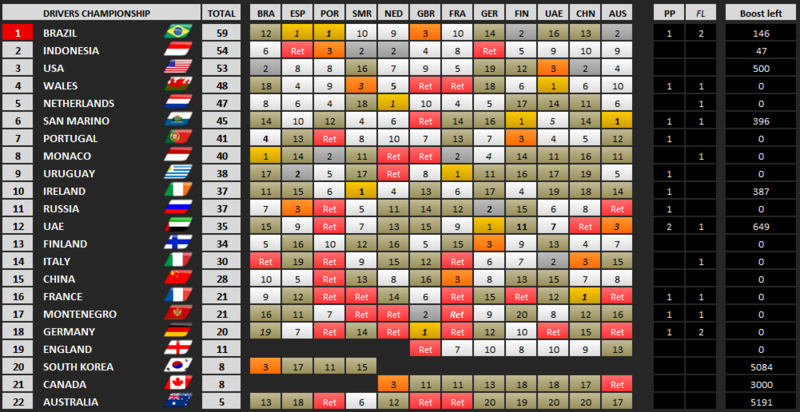 -Points are awarded to top 10 drivers, regardless of whether all 10 finish. Classification for retiree's is the classification GP4 provides. -Each car will have the same performance, set using the performance file – 850bhp, 1500 reliability. This is constant for all seasons since teams share cars on the performance file then we could only implement it if people scored identical points. -A variance value of 500 is used for every driver. 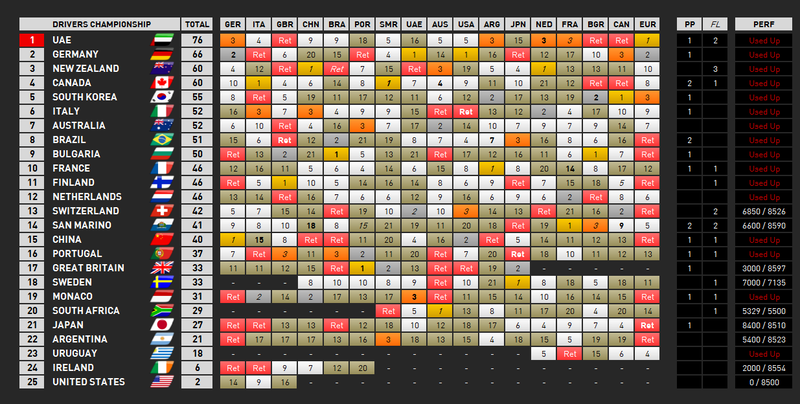 -Each driver will be given a base performance of 16000 for races, and 17000 for qualifying. -The team owner is given a ‘budget’ of 6000 points (500 * number of races, currently 12). -The team owner may allocate some of these extra points to the qualifying and race performances, up to a maximum of 500 each (ie, the absolute max performance is 16500 for races, and 17500 for qualifying). This limit is imposed in order to prevent runaway races. -Boost requests can be sent anytime, as long as the window for the respective GP isn't closed yet. -Irregular boost requests (using more points than one has left to spent) are ignored. If such a request is accepted by accident, the amount of extra boost will be deducted from the performance for the following race. -Performance allocations CAN be changed before the deadline falls, but the last known choice before the deadline closes will be the used one. -Each performance file containing the boost shall be posted before qualifying commences. If errors are found and a session has already been run, a rerun may be called upon to correct the erroneus result. These points are added on the the performance budget total for each manager. For example, season 1 finish = 1st, season 2 budget = 6100. Points Stay with that manager, so if said manager chooses to change nation, the points gained still remain. -If a participant leaves, they keep their current boost amount. If they are kicked/disappear, they get reset to 0. -Activity rules are to be brought in to promote activity. -Activity windows are to be introduced. This window will extend from one boost announcement message to the next, in order to accurately reflect a race window. 3rd window missed: Removal from the series. -If no user takes a slot after a 3rd window is missed, numcars.ini will be used to reduce gridsize. -A player that has been kicked can not rejoin in the same season. -Holiday notice can be given, but must be declared on the thread in advance. Either an end or length of the holiday period must be given, but length leaves space for interpretation. -A user who has declared a holiday may submit boosts for the races they will potentially miss. Team USA for me....hmmmm, a bit reluctant with this choice of mine, given the current political landscape, and the current POTUS. But, I have a awesome livery well underway, several good tracks in the USA that could be used...... Politics and GPGNC should never mix, so USA is in. Good to see the new thread up. With all these vacancies, I think it's about time I join this series as Team France. Team France's entry will be driven by #66 Romain Prost, and car and helmet design should be revealed by the end of the week. Do we have anyone volunteering to compile the mod? I can have a crack (using last season as a base) if there's no one more experienced? I am writing to officially announce that I resigned as manager of Bulgaria. I had great time here, but lately I rarely find time to follow up everything. It will be better for a fresh manager to try his luck. I hope Team Bulgaria will continue to participate, although organizers warned me that I am not allowed to set such a condition. Still, this is my desire and I hope it actually happens like that. > I join this series as Team France. > revealed by the end of the week. Re: GPG Nations Cup Season 6 - Vacancies! I'm thinking of giving this another crack. I wouldn't be able to help out with the running of the series, because the GPGSL takes up all my spare time. I would like to run as Great Britain, but as I can see there is already a Wales entry, would that mean I would have to run as England instead? Yes, would have to be England. Seem to remember we only allowed GB if none of the 4 countries were taken yet. Another reminder to all teams that I'll be able to do a render of your Season 6 car if you have decided to undergo a change in livery. please tell us a deadline for the end of the pre-season, at least an approximate one. Can't wait for the season 6 of GPGNC, and also the deadline for the liveries and helmet would be needed, probably. Up to the new mod maker(s) when he/they want to set the livery deadline. Mid-May would sound good to me. In the meantime deciding how many races we'll have, and how the calendar will be handled. 1 more entry to go and we'll have a full 22 car grid.